"What, are you crazy? A man in a really nice camper wants to put our song on the radio. Gimme a pen. I'm signing, you're signing, we're all signing." 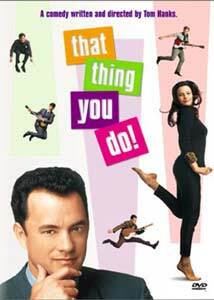 Following some intense work in Philadelphia, Tom Hanks took a break to write and direct That Thing You Do!, a comedy set in Erie, PA in the early 1960s. Guy Patterson (Tom Everett Scott, looking very much like a young Tom Hanks) is a young musician with an affinity for classic jazz, who works in his father's failing appliance store until he is asked to fill in for a local fledgling music group whose drummer has a broken arm. Singer/songwriter Jimmy (Johnathon Schaech) leads the band, his girlfriend Faye (Liv Tyler) supports the group's efforts, guitarist Lenny (Steve Zahn) cracks wise, and the unnamed bass player (Ethan Embry) does his best to keep up with the others. Under the pronunciation-confounding name "The Oneders" (one-ders, get it? ), the boys win a talent show with Jimmy's song That Thing You Do, modified on the spot by Guy's faster approach to the beat. They press a single, which finds its way into the hands of Play-Tone manager Mr. White (Tom Hanks). Suddenly, "The Wonders" are a young band with a hit song, trying to cope with sudden fame. Hanks avowed, modest intention for this directorial debut was to achieve a "refreshing change of pace," and he succeeds remarkably well. The film has a strong sense of its 1964 milieu, with period-perfect cars, costumes, music and advertising materials. And the titular pop song that carries The Wonders to fame nails the style dead-on, managing to be insanely catchy and lyrically airheaded, in the grand tradition of chart-topping singles. Hanks' script is charming and pretense-free, focusing on the characters' youth and excitement rather than trying to communicate any deep social message. An appealing young cast carries the lightweight script along with humor and energy. Tom Everett Scott is intelligent but not wise beyond his years as Guy, and he plays the drums credibly well onscreen. Liv Tyler is vulnerable and surprisingly real as Faye, while Johnathon Schaech's Jimmy broods and blusters darkly over his music and the price of fame. Steve Zahn gets all the best lines as Lenny, delivering a consistently hilarious performance, and Ethan Embry as the unnamed "bass player" is good-natured and enthusiastic, but not too bright. The film also includes early appearances by Giovanni Ribisi (as the group's "Pete Best," who broke his arm and missed the boat but bears no ill will towards Guy or his former bandmates) and Charlize Theron (in an atypical shallow-blonde role, with a voice she seems not quite to have grown into yet). Writer/director Tom Hanks also manages to turn in a solid performance in his own movie, playing Mr. White as a friendly but amoral creature of the music industry. He even gives his erstwhile "bosom buddy" Peter Scolari a small role. Hanks' direction is visually fairly pedestrian, but he obviously knows how to work with actors, bringing an unmistakable warmth and humor to the screen. That Thing You Do! will probably never be regarded as a classic of the American cinema; it's no Almost Famous, certainly, though it deals with some similar themes at a superficial level. But That Thing You Do! works by virtue of its simplicity, light-heartedness and more-or-less innocent outlook. It's the story of a rock-and-roll band, one of those movies that's immensely pleasurable simply because it doesn't try too hard. Image Transfer Review: That Thing You Do! is presented in its original 1.85:1 widescreen theatrical aspect ratio, with an anamorphic transfer drawn from a remarkably clean source print. Tak Fujimoto's photography is generally brightly lit and soft, with extremely shallow depth of field, and the digital transfer preserves the look with no distracting banding or blocking (don't adjust your set, the softness is intentional). Colors are bright and detail is solid. Another fine transfer from Fox. Audio Transfer Review: Fox presents That Thing You Do! in its original Dolby Digital 5.0 mix, with English and French 2.0 Surround tracks as well. The 5.0 mix is generally front-oriented, with some panning sound effects and a few spot effects (crowd noises and such) placed in the surrounds. Dialogue is crisp and clear, and music sounds the way it should; low-end bass is rarely called for here, but is present in the mains, despite the absence of a dedicated .1 LFE channel. The 2.0 mixes are much more centered in character, but retain the clarity of the digitally-mastered theatrical track; the French dub acting is pretty good, though some of the voices are jarringly different from the originals. The DVD certainly delivers in the audio department, a critical factor for this pop-music comedy. A collection of six theatrical trailers, including the A and B trailers shown in the US, as well as B and C trailers in Spanish and Italian. All are presented in Dolby 2.0 audio and anamorphic widescreen, though 3 are cropped vertically to a 2.35:1 ratio, while the others retain the film's 1.85:1 presentation. The Spanish Eso Que Tu Haces trailers feature Spanish narration and subtitled English dialogue, while the Italian Music Graffiti promos are completely dubbed (but feature "Coming Soon" text in English!) In both cases, the title song remains in English. The trailer source prints are in very nice shape, clean and colorful, except for the Italian C trailer, which exhibits some dirt and minor damage. A collection of six 1.33:1, panned-and-scanned television ads for That Thing You Do! ; most are thirty-second spots, one runs a full minute. These are typical television ads, though the "Meet the Wonders" spot is augmented by some very 1960s-esque stills of the characters (also seen in the Spanish and Italian C theatrical trailers). Oddly, three of the spots are in 2.0 mono, ProLogic-decoded to the center speaker, while three are in true Dolby 2.0 stereo, with no Dolby Surround flag (a configuration I've never encountered before). Early MTV veejay Martha Quinn hosts this 13-minute featurette, in 1.33:1 with Dolby 2.0 mono audio. It's typical behind-the-scenes fluff, heavy on clips with brief sound bytes from Tom Hanks, Tom Everett Scott, Liv Tyler, Steve Zahn, Johnathon Schaech, and Ethan Embry. Some of their comments are interesting, but this is promotional material, nothing more. Two music videos based on sequences from the film are presented in letterboxed nonanamorphic 1.85:1 format with Dolby 2.0 audio. Both were shot in a concert environment seen in the film, presenting the songs (That Thing You Do and Dance With Me Tonight) from beginning to end, and it's fun to see "The Wonders" playing to the crowd. Unfortunately, the videotape masters used here are of poor quality, very dark and smeary compared to the other material on the disc. That Thing You Do! is a breezy little period comedy wrapped around a catchy tune, joyfully innocuous and refreshing. Fox's DVD features a fine transfer and comprehensive "press kit" supplements from 1996. Recommended.